Tomorrow I will show you some other signs of the season. Not to worry – at least so far all our fluffy white precipitation looks like this. I don’t think that’s real frost, but it surely does look like frost (or meringue). I got to scrape frost off my car windows in Kansas City this morning. It took a real scraper, too – not one of those wimpy little rubber squeegie thingies. Now I have to figure out what that lovely whiteness is. Doggie? Human? It surely is pretty! Babs’ photo gives me a clue about the yellow trees I’m seeing. They might be maple – I always think of maple as red, but I guess they don’t have to be. When someone doesn’t even know what trees turn which color, she’s been away from autumn too long. The frosting on the cake is what we like to call Cowboy silk. We cover the floors with it. (Floors, walls, black sweaters.) I remember taking a friend to the airport in her car, back in the day when you went into the terminal with a friend to see her off. No one made you take your shoes off or assaulted you with a wand. I digress. When I returned to the parking ramp after a civilized farewell, frost had happened. There was no scraper in the car. There was, however, a stapler. One makes do. Maples can turn red or yellow or orange or fetching combinations of all the above. Gotta like that about maples. The hardwoods around my house are mostly beech and birch so I have a glowing yellow bower for a few weeks. Thanks for this glimpse of autumn and home. You are very welcome. A few more years Out There and this will all look very exotic to you. OK, maybe not. It smelled really good this year. That orchard looks just like here! It is just like there. Two shores of the same big blue lake. Same color scheme. I thought the Cowboy silk was a Santa Claus beard. Our yellow over on the Lake Michigan side of Grand Traverse Bay is mostly now reduced to popples, poplar, and birch. Some trees have yellow leaves only at their very tops and are bare lower down. Sometimes from a hill, looking down on a long expanse of bare trees, you’ll see the glad shout of a patch of bright yellow–and when the sun comes through the clouds and hits just that patch–. 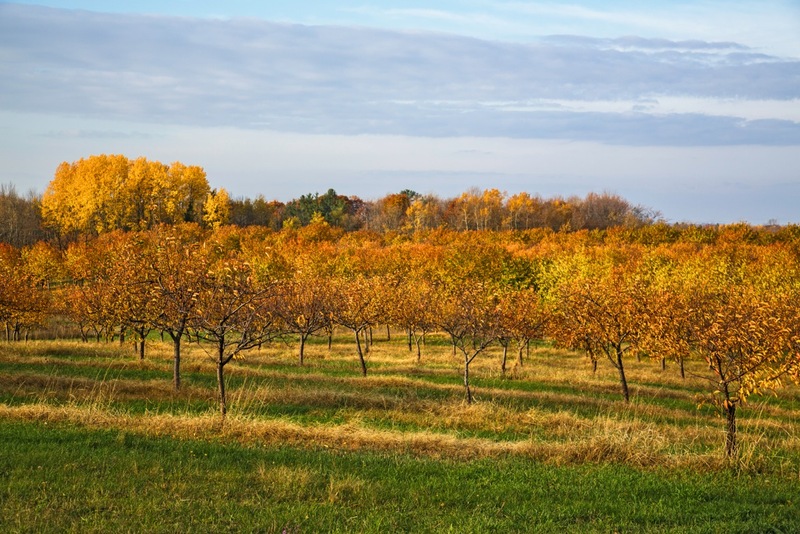 The orchards are always worth endless looking because there are so many different colors going on at once in those trees. All those observations are just exactly right. I believe we have the makings of a poem. Wish I was there enjoying the beautiful colors instead of hearing the wind and pounding rain of Hurricane Sandy. Its quite a mess here. I have been reading about it and listening to the radio – I will hold you in my thoughts today. I very much prefer that type of fluffy white to what will be out there in the months to come! I like a nice balance of the two. I’d prefer the fluffy spanielfall to remain on the spaniel altogether, and would prefer that we have enough nice white blanket on the ground to protect the orchards and refill the Bay, which is ridiculously low. For me, it was the clocks going back yesterday that finally convinced me summer isn’t coming back. Not that it was ever really here this year, but the leaves are dropping faster than I can rake them up, the heating’s back on and, dang it, I need to find my gloves! Our little puss is barely shedding at all, a sure sign things are getting colder. 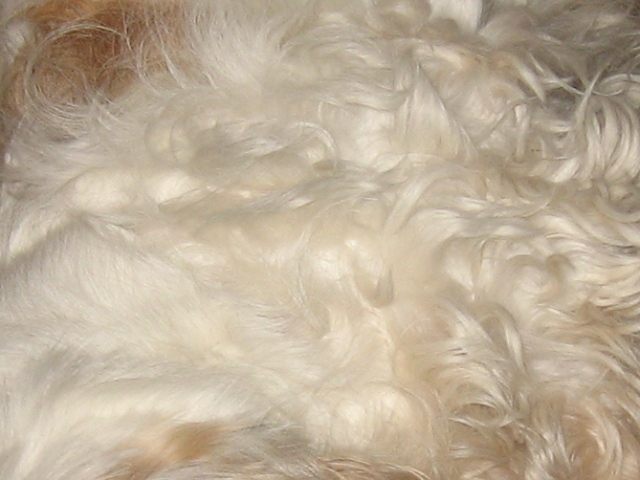 Having spent all summer vacuuming up cat hairs, I feel for you on the spaniel front! The Cowboy sheds freely even in the coldest weather. In compensation, he is a very good cuddler. No color to speak of left here, especially after all the wind yesterday. I knew instantly what the white silken stuff was…because I have someone here with a similar white silken tummy. I’d take the shedding too for what is offered in return. Just got back from the “short walk” with Miss Sadie and the Cowboy, during which Miss Sadie made it clear that if we were crazy enough to go down to the beach today she would wait for us at the top of the stairs and walk back to the house with us–or go for reinforcements, depending. I told the Cowboy that Miss Sadie might know something we did not and turned for home and breakfast. Lots of wind. Right here, right now, nothing out of the ordinary for us at this time of year, but holding the whole eastern seaboard in our thoughts today. I did, and I will dig myself out any day now and do it. Meanwhile, Babs has sent another photo, so that’s all right then.